The Fothergillas I planted have suffered mightily–from rabbits to drought to drenching rains. I was almost ready to give up on them and chalk it up to Kansas learning. But I love this plant and I knew it would make a wonderful understory shrub layer in the woodland if I could get it started. Well, patience succeeded. This year, though they are small, they are gorgeous. The white flowers are gleaming in the woodland. They could not be more beautiful. They help give shape to the space. 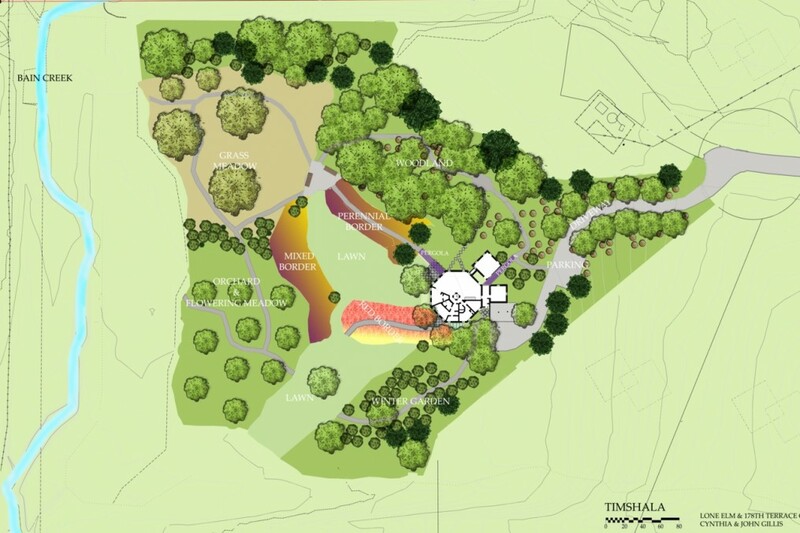 We’ve planted most of the trees and shrubs that will make up the main structure of the Woodland garden. The Pines and Maples will give the shade that defines a woodland. And eventually, if all works well these will also give their name to the area; it will be a Pine and Maple Woodland. Redbuds and Dogwoods will form most of the understory layer and give their own softer shade…protecting the Fothergillas (35 of them) and Oak Leaf Hydrangeas (12). And these shrubs will lead the eye through the space, their human scale showing the size and form of the Woodland. And of course they will add their own spring flowering, summer form, and autumn color. A grove of Birches acts as an entry to the Woodland as well as providing more four-season beauty. Once these trees and shrubs grow and start to give enough shade, it will be time to plant some of the shade-loving groundcovers that will help define the space: Tiarella, Gingers, Trillium, Solomon’s Seal…masses of each to help keeping you moving through the space. It is so exciting to see some of the spaces actually taking shape, not just in my mind, but in reality. Seasonal interest…what’s up-to-date in Kansas in the spring. I’ve completed a lot of plant layouts – most of the trees and shrubs anyway. Now I’m testing my plans against reality. And reality in Kansas is not quite the same as reality in Brooklyn. At least as far as climate is concerned. As I travel around at this glorious time of year I’m seeing many of the trees and shrubs I’m planning to use, and seeing what they look like in (so far) two seasons: winter, when I first arrived, and now spring. I think. The first trees I noticed in bloom were the Star Magnolias, their white blossoms looking almost tropical in the snow just a few weeks ago. Then, about mid-April, clouds of white everywhere – as the ornamental Pears started to bloom. Though they are pretty enough in bloom, they won’t be going into my garden – they’re too weak wooded and their interest is fleeting. 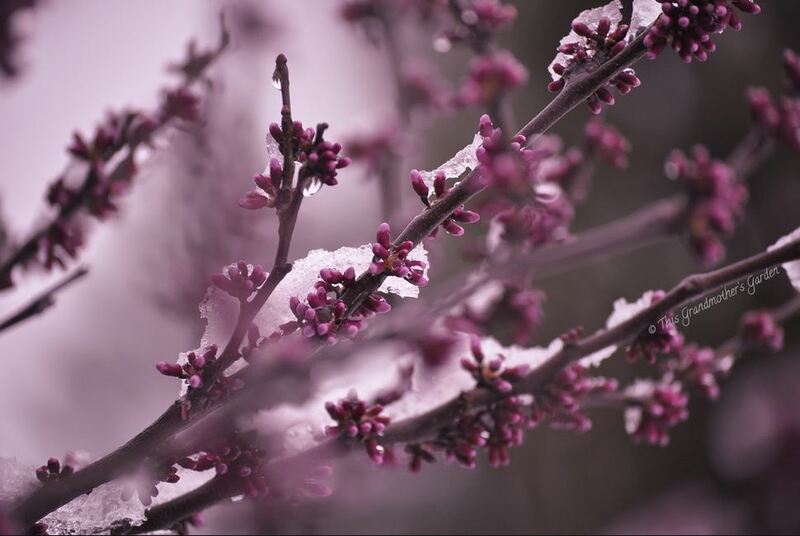 Right now the Redbuds are putting on their show, with bright pink blossoms lining, and outlining, every branch. I’m planning to use quite a lot of (native to Kansas) Redbuds in the woodland, and so it’s good to know just when they are at their most garish (I mean that in the nicest way. After the drabness of winter I hunger for lots of bright color) I’ve seen Fothergillas sending up their bottlebrush flowers. Some Lilacs are in bloom. And flowering Crabapples – I’ll be using those in the orchard. Most of the ones I’ve seen are a quite dark, rich red, but I’m planning to use a couple of white-flowering varieties. There should be a lot of color nearby from the Red Border and the Fennel & Rose Border and I think the red flowers (and later purple leaves) will conflict.